You can also ask one of the locals. From the B.C. Mainland: Take the ferry to Nanaimo. From Nanaimo: Take highway 19 north to Campbell River. Turn right on Island Hwy (the old hwy. 19A) as far as the ferry dock. 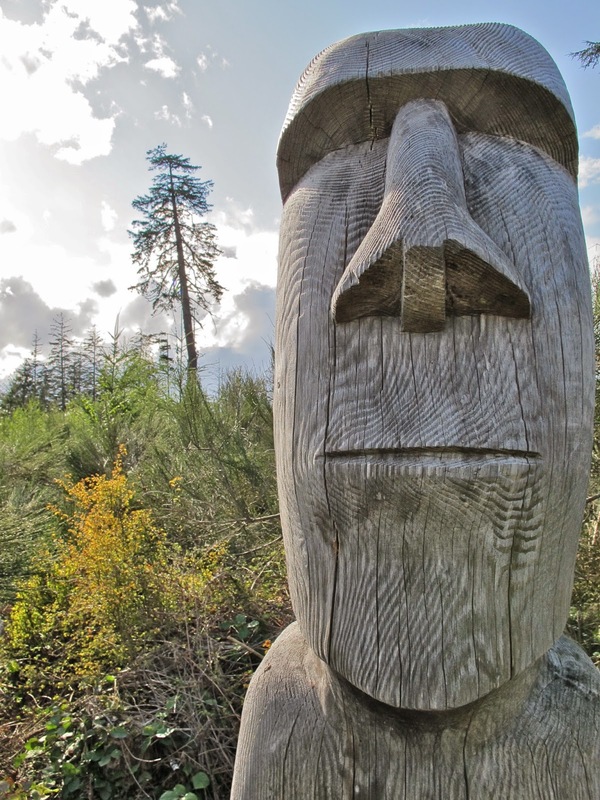 If you are planning several trips back to Vancouver Island from Quadra, load up a B.C. Ferries card so that all your trips will be less expensive than if you pay cash for each trip. The ferry schedule is very confusing now. Check the Campbell River-Quadra Island ferry schedule before planning your trip. From the Quathiaski Cove ferry dock: Cove Road goes up the hill to a T-junction at the Quathiaski Cove shopping centre. Groceries, a Post Office, drugstore, bookstore, health food store, the Quadra Island Medical Clinic, restaurants, the Credit Union & others are located here. Take a left on Harper Road, proceed straight until the next T-junction. You’ll turn right here at the only gas station on the island. Fill up early, it closes at 8 PM. The Café Aroma is here too. Excellent coffee, etc. You’re now on Heriot Bay Rd. There’s a 3-way intersection ahead which could fool you. Vehicles coming from the other two directions must stop, but you don’t. Even tho’ a sign reading “Heriot Bay” points to the left, you must go straight ahead. This is the Heriot Bay Road. At the top of the second hill is another T-junction. Turn left. This is still Heriot Bay Rd. Go north 2 km. 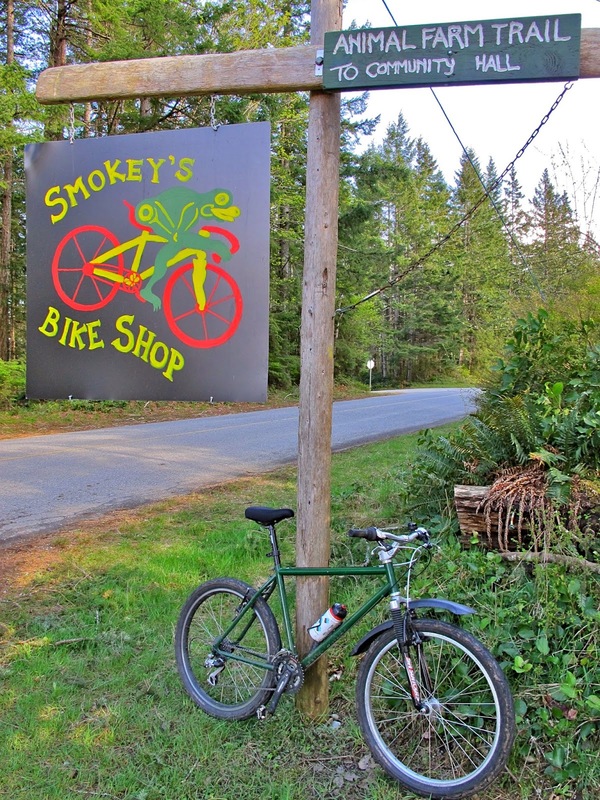 You will see a yellow highway sign with a Bicycle, a horse, and the word "Crossing"
The next driveway left is Smokey’s Bike Shop & the Quadra Bike School. Vancouver and Victoria have connections to Campbell River via Greyhound or Island Link Bus, or by Pacific Coastal Airlines. From Comox airport take a taxi to the Petro Can gas station for an Island Link bus ride to Campbell River, or to the Greyhound terminal. You can also fly directly from Comox to Campbell River. A taxi van will take you from the Campbell River airport to the Quadra ferry dock. Then phone the Bike School at 250-285-2447 for a ride from the ferry.